Other than bug fixes and support for any new services, the bulk of the development effort from now on will focus on the boto 2.0 release. This will be a significant new release with some major changes and exciting new features. While adding support for these features to boto, I also took the opportunity to (hopefully) improve the overall boto support for CloudFront. In this article, I'll take a quick tour of the new CloudFront features and in the process cover the improved support for CloudFront in boto. First, a little refresher. The main abstraction in CloudFront is a Distribution and in CloudFront all Distributions are backed by an S3 bucket, referred to as the Origin. Until recently, all content distributed by CloudFront had to be public content because there was no mechanism to control access to the content. Not only does the add_object method copy the content to the correct S3 bucket, it also makes sure the S3 ACL is set correctly for the type of Distribution. In this case, since it is a public Distribution the content object will be publicly readable. The recently announced streaming feature of CloudFront will be of interest to anyone that needs to server audio or video. The nice thing about streaming is that only the content that the user actually watches or listens to is downloaded so if you have users with short attention spans, you can potentially save a lot of bandwidth costs. Plus, the streaming protocols support the ability to serve different quality media based on the user's available bandwidth. To take advantage of these cool features, all you have to do is store streamable media files (e.g. FLV, MP3, MP4) in your origin bucket and then CloudFront will make those files available via RTMP, RTMPT, RTMPE or RTMPTE protocol using Adobe's Flash Media Server (see the CloudFront Developer's Guide for details). The process for creating a new Streaming Distribution is almost identical to the above process. Note that the url method still returns the correct URL to embed in your media player to access the streaming content. I'm only going to cover the first part of the process here. The CloudFront Developer's Guide provides detailed instructions for creating the signed URL's. Eventually, I'd like to be able to create the signed URL's directly in boto but doing so requires some non-standard Python libraries to handle the RSA-SHA1 signing and that is something I try to avoid in boto. Let's say that we want to take the public Distribution I created above and turn it into a private Distribution. The first thing we need to do is create an Origin Access Identity (OAI). The OAI is a kind of virtual AWS account. By granting the OAI (and only the OAI) read access to your private content it allows you to keep the content private but allow the CloudFront service to access it. If there is an Origin Access Identity associated with a Distribution then the add_object method will ensure that the ACL for any objects added to the distribution is set so that the OAI has READ access to the object. In addition, by default it will also configure the ACL so that all other grants are removed so only the owner and the OAI have access. You can override this behavior by passing replace=False to the add_object call. Finally, boto makes it easy to add trusted signers to your private Distribution. A trusted signer is another AWS account that has been authorized to create signed URL's for your private Distribution. To enable another AWS account, you need that accounts AWS Account ID (see this for an explanation about the Account ID). As I said earlier, I'm not going to go into the process of actually creating the signed URL's in this blog post. The CloudFront docs do a good job of explaining this and until I come up with a way to support the signing process in boto, I don't really have anything to add. The recent introduction of Boot From EBS for EC2 opens up a lot of new possibilities. But there are some bootstrapping issues to deal with. There aren't many EBS-backed AMI's available yet and, given the rather complex process involved in porting them, it may take a while for them to show up. This article will walk through the process of converting a popular S3-based AMI to an EBS-backed AMI. I don't guarantee that this is the best process and I certainly wouldn't recommend that anyone use the resulting EBS-backed AMI for anything other than testing and further development, but it puts a stake in the ground regarding a potential process. I'm sure I will hear about the shortcomings and possible improvements! So, at this point I have a new EC2 instance up and running using the S3-based AMI and a new 10GB EBS volume attached to that instance. Now, I need to login to that new instance and do a bit of work. /dev/sdh is entire device, not just one partition! So, basically I have ssh'ed into the new instance, run apt-get update and apt-get upgrade to install all of the latest patches, formatted the EBS volume as an EXT3 filesystem, mounted that filesystem as /ebs and then copied the entire contents of the current root volume over to the EBS volume. Then I unmount the EBS volume. Now, let's go back to my Python session running on my local machine. Now let's SSH into our new EBS-based instance and make sure everything is okay. I have made this AMI public and available in the us-east-1 region. Feel free to fire it up and play around with it but be aware that none of the careful testing that accompanies Eric's or Canonical's AMI releases has happened here so it is for illustrative purposes only. I think one point people often overlook when discussing common cloud API's is the overall maturity of API's for different types of cloud services. Trying to achieve commonality on API's that have not yet reached maturity can be a frustrating and time-consuming effort. So, how stable are the API's for common cloud computing services? This article focuses on a couple of different measures of API maturity to try to answer that question. One measure of API maturity is churn. In other words, how much is the API changing. Mature API's should show relatively small amounts of churn while immature, evolving API's will show increased levels of churn. 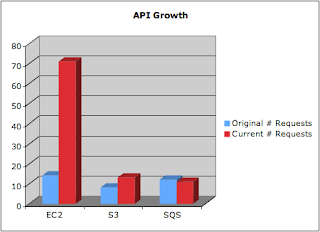 The chart below shows one measurement of churn, namely the growth in the API. For HTTP-based API's, this can easily be measured by the number of different types of requests supported by the API. This chart is showing us the number of API requests supported by each of the services at launch compared to the number of API requests currently supported by the services. The EC2 API has grown from 14 requests at launch (08/24/2006) compared to 71 requests today. This includes requests for the CloudWatch, AutoScaling and Elastic Load Balancing services which are essentially part of EC2. Even if you exclude those services, though, the total is now 47 API requests for EC2 today, a 3X growth. In comparison, S3 went from 8 API requests to 13 and SQS actually reduced their API requests from 12 to 11. During this same time period, EC2 has published 17 API version while SQS has published only 4 and S3 is still running the same API version published at launch, even though some new capabilities have been added. Another way to measure maturity is to compare similar API's offered by different vendors. Mature API's should show a great deal of similarity among the different API's while immature API's will tend to show many differences. The reasoning behind this is that a mature API should be based on a well-defined set of abstractions and therefore the type and number of API calls dealing with those abstractions should be similar across vendors. In an immature API, the abstractions have not yet been fully fleshed out and you will see more variation among similar API's from different vendors. This graph is comparing the number of API requests that are common between the different vendors (shown in blue) versus the number of API requests that are unique in a particular vendor's API (shown in red). An API request is considered common if both API's have similar requests with similar actions and side effects. Large blue bars and small red bars indicate more consistent API's whereas large red bars and small blue bars indicate less inconsistent API's. The graph shows a fairly high degree of consistency between the two different queue service API's. Again, we see a fairly high degree of consistency across all three API's. The major difference is related to the Azure Blob service's handling of large Blob's. It places a limit of 64 MB on individual pages within a Blob and allows multiple pages to be associated with a particular page. The other services have no equivalent abstraction, hence the differences. Here we see the opposite of the graphs for the queue and storage services. The large red bars indicate a large number of API requests that are unique to a particular vendor's API and a relatively small number of API requests that are common across both vendors. In fact, aside from the basic operations of listing instances, starting/stopping instances, and listing/creating and deleting available images, it was difficult to even compare the two API's. The handling of IP addresses, networking, firewalls, security credentials, block storage, etc. were unique to each vendor. So, does that mean that common cloud API's are impossible? Of course not. However, I do believe that achieving meaningful levels of functionality across multiple vendors API's (especially around servers) is building on a shifting and incomplete set of abstractions at this point. Solidifying those abstractions is key to achieving useful interoperability.